Winner Junior Teeners played Tyndall in a double header June 23 at Leahy Bowl. Tyndall won both games. In the first game, Tyndall won 2-1. Winner took the lead with a 1-0 score in the third inning with Tyndall scoring two runs in the fifth inning. Ethan Bartels pitched all five innings. Leading hitters were Pierce Nelson, 1-3; Aiden Barfuss, 1-2; Ethan Bartels, 1-2; Adam Bohnet, 1-2 with a double and Ashton Klein, 1-2. In the second game, Winner Junior Teeners were nipped 11-10. Bartels had a double and Barfuss belted a triple. Other hitters were Nelson, 1-3; Riley Orel, 1-3; Austin Wheadon, 1-3. Also getting a hit for Winner were Ashton Klein, Silas Chasing Hawk and Justin Hausmann. Pitching in this game were Coy Brickman, Klein and Chasing Hawk. 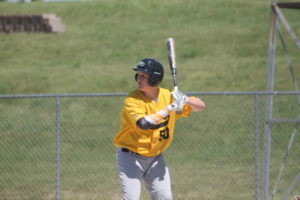 Winner Junior Teeners defeated Valentine, Neb., 13-0 in the first game of a doubleheader June 26 in Winner. Justin Hausmann pitched four innings. Winner had a lot of success at the plate. Leading hitters were: Michael Olson, 2-2; Pierce Nelson, 1-3; Aiden Barfuss, 3-3; Charley Pravecek, 3-3; Ethan Bartels, 1-3; Adam Bohnet, 2-3; Ashton Klein, 1-1; Riley Orel, 1-1. In the second game, Valentine defeated the Winner Junior Teeners 4-2. Pitchers were Pierce Nelson and Charley Pravecek. Orel and Bohnet had hits for Winner. Winner Junior Teeners defeated Colome 9-1 on June 28. Winner scored three runs each in the first and four innings. Leading hitters were Pierce Nelson, 2-3; Aiden Barfuss, 2-3; Ethan Bartels, 1-2; Owen Duffy, 1-2 and Riley Orel, 1-2. For Colome, Jack Peters and Hayden Thieman each had a hit. Pitching for Winner were Ethan Bartels and Silas Chasing Hawk. Joey Cole pitched for Colome. In the second game, Colome won 8-6. Winner Junior Teeners played two games in Sturgis this weekend. Sturgis defeated Winner 14-4 in the first game on Saturday. Aiden Barfuss had Winner’s lone hit and was 1-3 in the game. Pitching in this game were Justin Hausmann and Charley Pravecek. In the second game, Newcastle, Wyo., defeated Winner 10-8. The fifth inning was big for Winner as they scored four runs. Owen Duffy hit a double and Aiden Barfuss belted a triple. Other leading hitters were Pierce Nelson, 2-2; Charley Pravecek, 2-3; Ethan Bartels, 1-2. Pitching for Winner were Barfuss and Bartels.